THE GHANA Anti-Corruption Coalition (GACC) has challenged the ruling New Patriotic Party (NPP) to speed up the delivery process of some of its key 2016 manifesto promises on good governance and fiscal transparency. 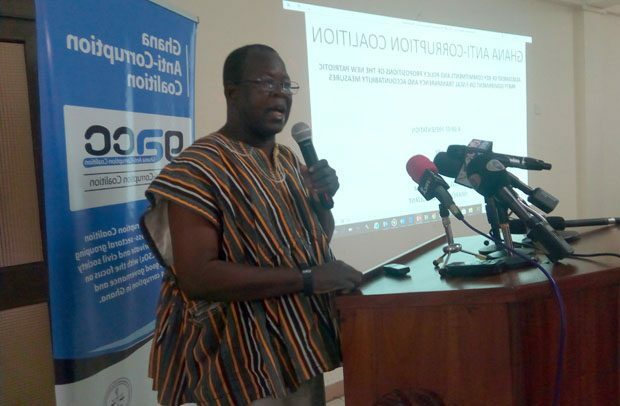 GACC made the call over the weekend in Accra, saying “the NPP has not done much with regard to delivery on its good governance and fiscal transparency promises made to Ghanaians ahead of the December 7 polls”. In a presentation on the commitments and policy propositions of the NPP government on fiscal transparency and accountability, Vitus Azeem, a policy consultant, outlined a number of promises, which he said, the NPP has woefully failed to fulfill after 18 months in office. The assessment of the performance of the government was made from the state of the nation address delivered by the president on two occasions; his inauguration speech on January 7, 2017; the budget statements presented to Parliament by the Finance Minister; among others. According to him, key among the unfulfilled promises were the need to pass a fiscal responsibility law to bring comprehensive accountability, transparency and stability to the budget process; the need to establish a fiscal council and financial stability council; the need to oversee the election of MMDCEs in two years of coming into office. “However, there are a few cases involving appointees of the previous government before the courts,” he added, saying there was still no bill before Parliament for enacting the Code of Conduct Bill. In general, he said, a number of promises have been delivered while others have not been touched at all. According to him, the reduction of the corporate and by implication marginal tax rate from 25 per cent to 20 per cent has been put on hold while the enactment of a fiscal responsibility law, which is to pave the way for the establishment of a fiscal council and financial stability council, has not yet been brought before Parliament. “The NPP government has two and half years to end its first term in office and it is important that CSOs monitor the fulfillment of these promises and hold the government accountable to deliver on the promises,” he stated. According to him, the essence of the report was not to project the NPP in bad light but to create awareness among Ghanaians so that they can demand accountability from their political leaders. Executive Secretary of GACC, Beauty Emefa Narteh, observed that it was important to take the fight against corruption seriously because it has an impact on the economy.